Les Parks of A Tidewater Gardener has been hosting the Winter Walk-Off series since 2011. I participated in New York City in 2011, in London in 2012 (London), and in Arlington (VA) in 2016. This year my walk was completed in New York City. After a day mostly spent indoors on Sunday, I was itching for a Winter Walk-Off. I headed to my favorite walking place, Washington Square Park. I walked the wildlife transect loop (a project of WSP Eco Projects) looking for birds. In particular, I was hoping to spot the Red-tailed Hawk pair hunting or gathering nesting material. I did see both hawks both on and off the nest, and possibly a third hawk. For cameras I have a smartphone and a compact 90mm/3.8X camera. I only had the former on me. I did not attempt any hawk photographs. It was more fun to watch them with my eyes and through my binoculars. I was surprised to see a Northern Mockingbird out on a lawn. In my post about mockingbird songs, I mentioned that I typically see this bird in dense vegetation which is unusual for the species. All About Birds describes the Northern Mockingbird as conspicuous. I kept an eBird checklist during my walk and listed the usual winter birds of Washington Square Park: House Sparrow, White-throated Sparrow, European Starling, American Robin, and pigeon. Another bird surprise was a Turkey Vulture flying low enough over the park to rattle the pigeons. Trees are another passion of mine, and there are beautiful trees in Washington Square Park. I noticed that red maples and cornelian cherries (really dogwoods) are still blooming. Next to come are the showstopper magnolias, cherries, and crabapples. I look forward to reading all the Winter Walk-Off posts. You can find them at Winter Walk-Off 2018 on A Tidewater Gardener. I am so glad you were able to participate again. It makes me feel better to know there is so much bird life in Manhattan. Though I am not a birder, my eyes have been on them for the past couple of weeks. Ospreys have started to return, and they are one of my winter's over signs. I watched a southern cousin of your mockingbird and a blue jay squabble over who had rights to the fruit on my Hedera colchica. The robins have ceased being silent, the cardinals as well. All winter I've been enjoying my crows; they seem to be more social with each other in the winter. Thanks again! I am new to birding and am glad NY supports such a diversity of species. I've enjoyed the snow birds but am looking forward to the influx of spring migrants, if spring weather ever arrives. It’s always interesting to find out about the bird life in cities. Thanks for the report. Thank you for reading, Marilyn. 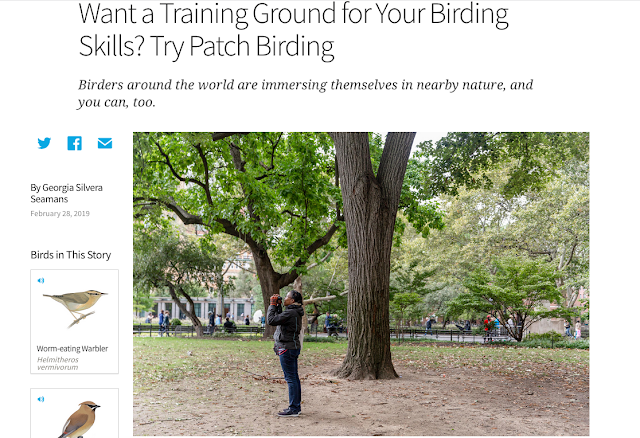 The bird life in NY amazes even the experienced birders. Nice walk off, love seeing all the birds. Yours is the second post I have read today that had a Cornus mas. What a pretty tree/shrub. What a lovely coincidence. The Cornelian cherry (dogwood) really brightens the winter landscape.